Unknown to many, the bagworm can become a serious pest to ornamental landscaping without a homeowner ever noticing the insects or symptoms. Their inconspicuous bags are sometimes the key sign of these damaging pests, although bagworms are skilled at making their bags look just like the leaves of their hosts. These pests have one generation per year and have clearly defined life stages. Bagworms prefer to feed on a host of evergreen and deciduous trees and shrubs, although some are more tasty to them than others. 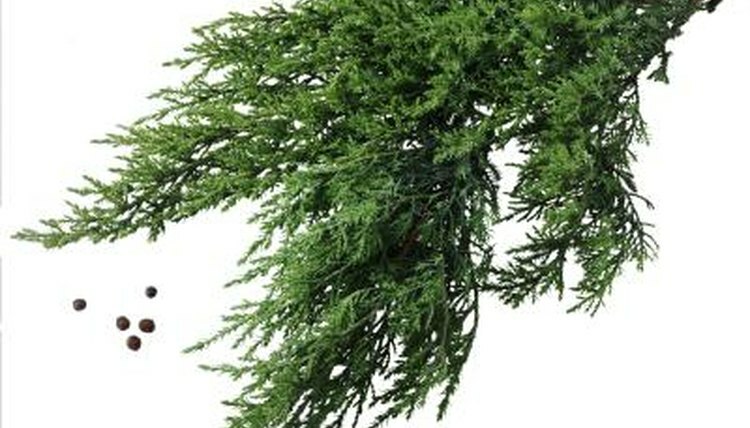 Preferred evergreen hosts include juniper, arborivtae, hemlock, fir and pine. Although not as common on deciduous plants, deciduous hosts include locust, honeylocust, elm, fruit trees and willows. Their namesake bags are inconspicuous due to the camouflage of leaves and twigs woven into the design. Adult males emerge in late summer or early autumn and begin their quest for a mate. The males are small, hairy, black moths with clear, half-inch long wings. Their antennae are feathery, like many other moth species. Adult females, on the other hand, lack wings and remain within the bag. Their cylindrical bodies resemble those of maggots; females don't possess functional eyes, legs, mouthparts or antennae. After mating, the female produces 500 to 1,000 eggs within her bag and then dies. In most species, the larvae hatch in early spring after overwintering as eggs in the bag. They emerge through a small hole in the top of the bag and lower themselves on silken strands to begin feeding on the leaves of the host plant. Some larvae release a silken strand to carry them on the wind to new host plants. Larvae are voracious feeders; entire trees can be defoliated if the population is large enough. The larvae feed through late summer or early autumn before beginning their short pupation. Throughout the larval stage, bagworms create protective bags that they carry upright as they feed. Throughout this stage, the larvae add leaves and twigs to the bag to create the camouflage. When it's time for pupation, the larvae attach the bags to twigs and then crawl upside down within the bag to complete their metamorphosis into adulthood. From start to finish, the lifespan of the bag worm is approximately one year. One generation per year is typical. The eggs of most species overwinter within the bags before starting their damaging behavior all over again. Females typically drop to the ground and die after laying eggs, although females of some species will remain in the bag after death.